November 22, 2019 can not come soon enough. Yes, I am a college student, and yes, I absolutely love "Frozen". The music, the characters, the heartwarming moments, the funny moments, the movie itself just brings me joy (and Elsa is awesome and the Disney Princess we need). So naturally, with my childlike love of "Frozen," I was crazy excited to finally watch the newly released teaser trailer of "Frozen 2". I wasn't the only one. 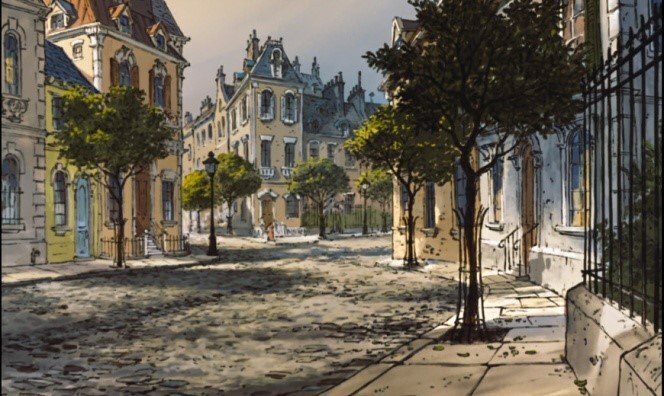 After precisely 24 hours, this movie's teaser was awarded the honor of most watched animated film trailer of all time. If you haven't seen the new teaser trailer for Disney's "Frozen 2" (which you can find here), then be wary to read ahead because this post contains spoilers (for the trailer anyway). If you have seen the trailer, you're most likely observing and wondering the same things I am. Below contains a list of observations and questions (possibly some theories, though I can't definitely answer anything), of "Frozen 2" based on the trailer we were given. And trust me, there's a lot to talk about. 1. First of all, that was EPIC! The teaser trailer for the first "Frozen" movie capitalized on laughs and cute characters (Olaf and Sven) to amuse children and convince them to bug their parents enough to see Disney's newest animated feature. Between crashing waves, quick sword-handling, and more than one breath-taking use of magic, this trailer gives the upcoming movie a tone of perilous adventure and fight for survival. 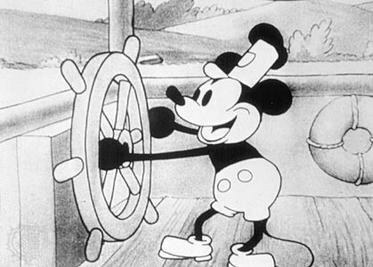 Possibly one of the best showcases of Walt Disney Animation Studios' talent of all time, the dramatic seascapes and dark imagery are sure to get any action movie fan out of their seats and into the theater. However, it is also possible that they just took all the epic parts of the movie and put them into this one trailer so they could get people hyped up. 2....but why is it so epic? Are they stuck somewhere? We have scenes of both Elsa and Anna near the sea by those huge, black, foreboding rocks. While the first scene could very well just be Elsa trying to prove to herself that yes, she can conquer the ocean (because that's just the kind of defiant person she is), but there is a certain franticness (not quite a word, but seems to fit) to her actions that may point to a deeper peril. 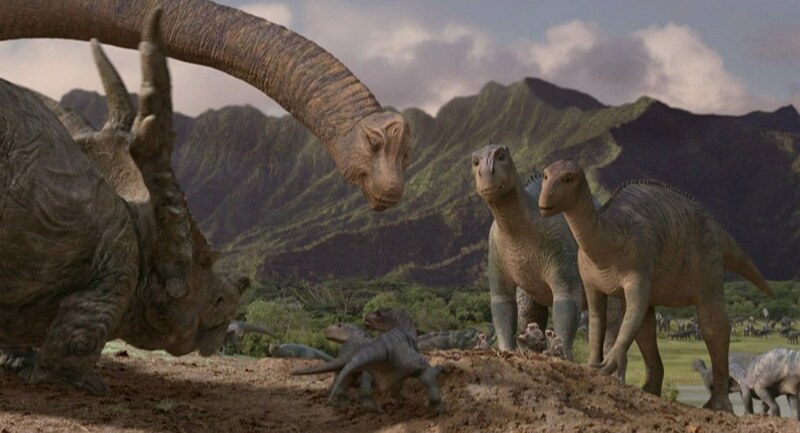 Then we get Anna crying and climbing over the same types of rocks, so Elsa is not the only one facing some sort of obstacle around this particular occasion. 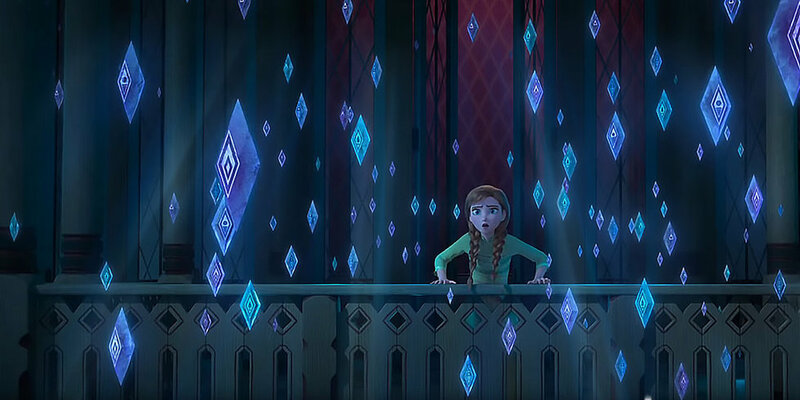 In fact, the only image we actually get of Arendelle is Anna running on her balcony for a second in the middle of the trailer. 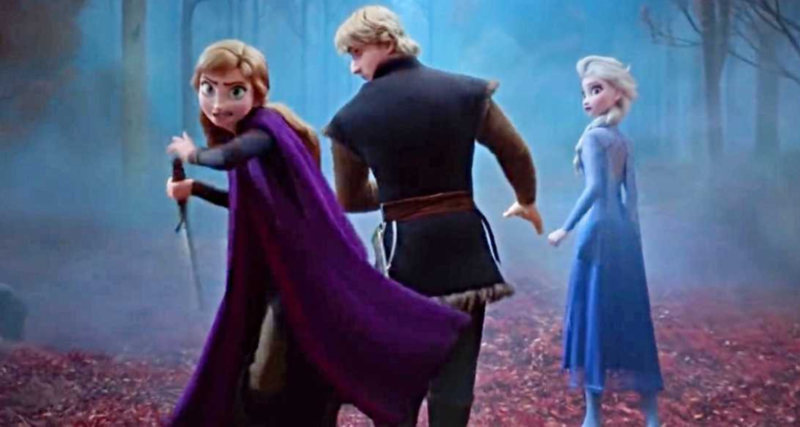 Could this have been from the very beginning of the movie, before they get stuck on the rocks, and they are in fact trying to get back to Arendelle? 3. Honestly, it's really hard to figure out a plot to this new movie. At it's most basic level, it looks as though fall has finally found it's way to Arendelle after the unexpected winter of the last movie. And yet, there is something about this fall that our heroes don't seem to like (just look at their worried faces at the end of the trailer to see what I mean). Is there a new character with fall powers of some sort, like Elsa with her ice/winter powers? And if so, why is that a bad thing? 4. There's two new characters! Who are they? Where did they come from? While we only get quick glimpses of them in trailer, they certain open the story to a world of possibilities. Do they have something to do with the fall that's swept the land? 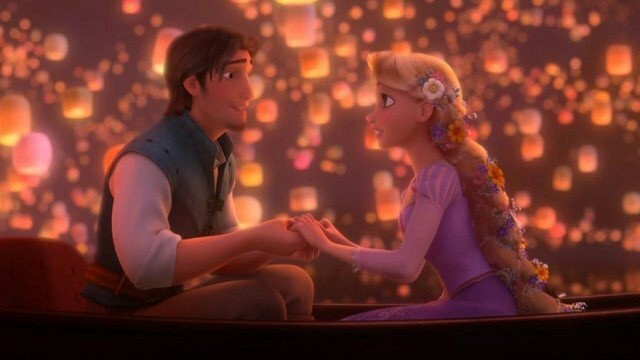 Are they Easter Eggs like Rapunzel in the last movie (do they have any relation to her)? And possibly the most important question, do they pose a threat to Anna and Elsa? 5. New hair, who's this? 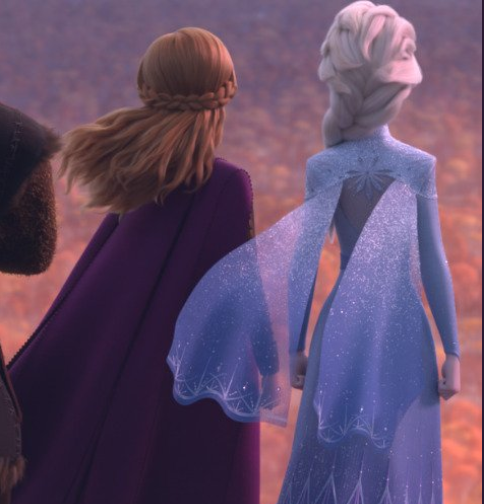 Elsa ties her hair up in a ponytail at the very beginning of the trailer, a far cry from her classic braid, while Anna forgoes the braids altogether in favor of loose hair blowing in the wind. While both the princess and Queen look wonderful, I definitely think Elsa's iconic braid should be here to stay. And in the last image of the trailer, it looks like it does make at least one appearance. 6. Kristoff is definitely NOT your typical knight-in-shining-armor. When we first meet Kristoff, he is anything but the normal, well-mannered, charismatic, considerate prince that frequent Disney princess movies. Sloppy, smelly, a little rude, and lives with a reindeer, Kristoff does not seem fit for a princess. 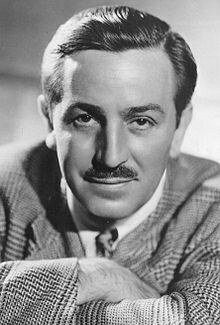 But as we come to really know him, he proves that first impressions are never quite as good as reality, and his aversion to the royal prince stereotype makes Anna's love for him all the more powerful. 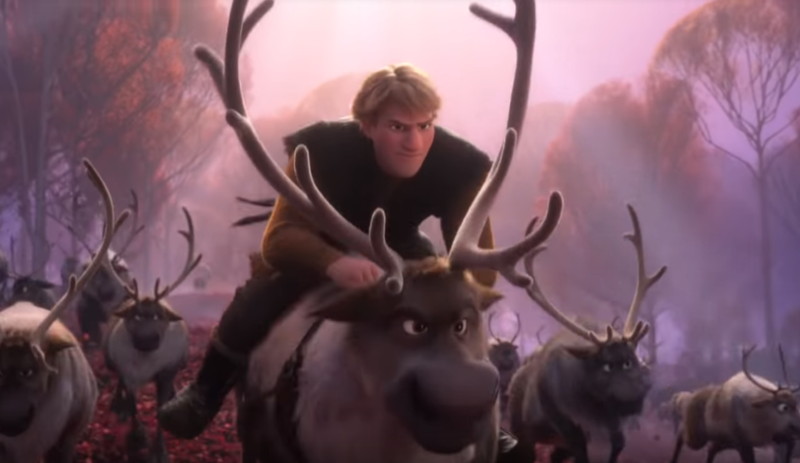 This same idea is enforced in the new trailer when Kristoff is seen leading not soldiers and majestic horses into battle like one would generally assume for a Disney hero, but a herd of reindeer, with him and Sven determinedly at the front. 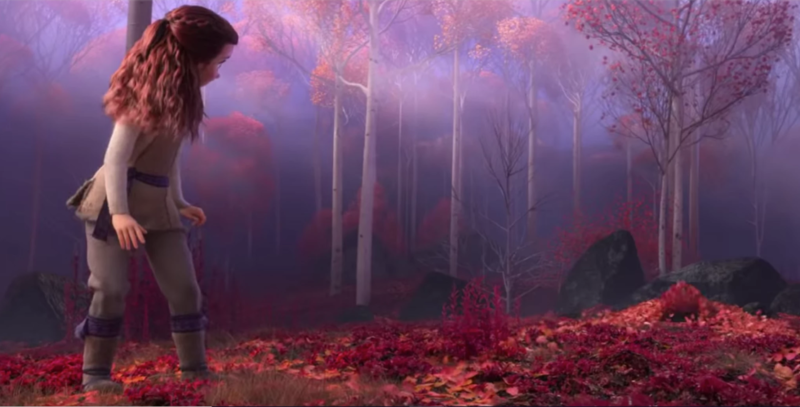 While this scene contributes to the overall epicness of the trailer, as it is coupled with brilliant autumn colors and a frantic tone, it also serves to show that these characters are still the same ones we fell in love with in the first movie. Also, where did he find that herd of reindeer? And why does he need them? Is this leading us to believe that there will be an epic battle of some proportion at the end of the movie? 7. Anna is about to wreck havoc with that sword. I love Anna's character to death, but she is a feisty one. And I fear for the person on the other side of that sword. 8. What secrets does the new Frozen poster hold? After the release of the new trailer and movie poster for the second "Frozen" movie, Josh Gad tweeted "If you look hard enough, this teaser poster will reveal quite a few surprises". The new poster features a snowflake, not entirely like the one from the first movie, front and center, with four small symbols within each main icicle. 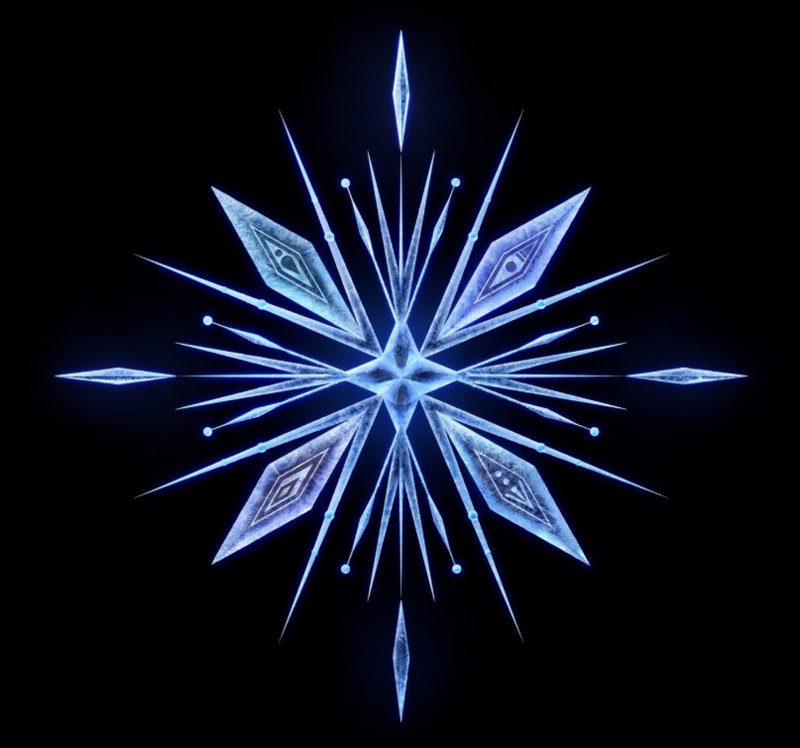 Naturally, Frozen fans like myself won't stop speculating as to what these symbols and this snowflake mean. 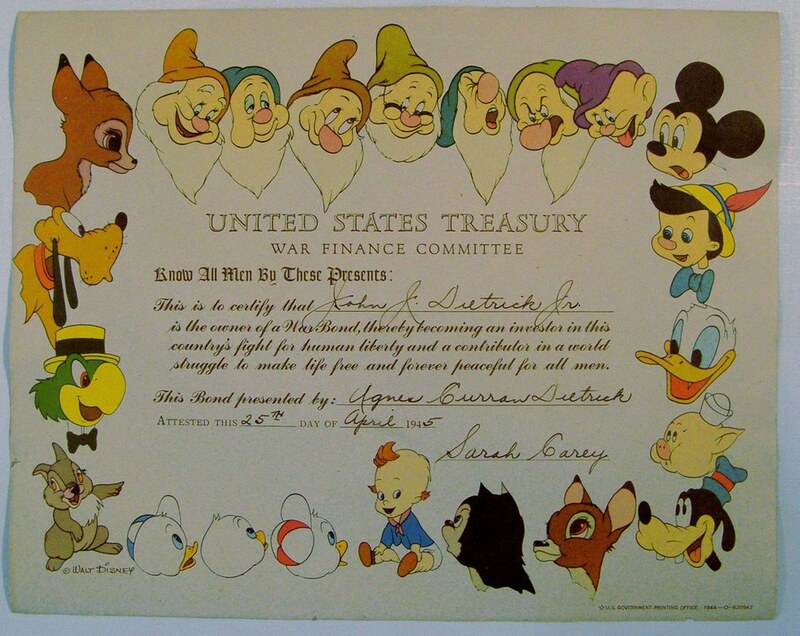 Some popular theories indicate that these could represent the four elements, or possibly even the four seasons (which corresponds with the theory that this movie will find Elsa discovering others with powers similar to her own). These four symbols also appear in the ice features Anna sees outside her balcony in the middle of the trailer. This is only the teaser trailer, which means there's loads more "Frozen 2" content to come. From a full-length trailer, more posters, and finally the movie itself, it's no secret that the world is begging for more Frozen, and fans like me will be there the entire time, speculating, questioning, and overall supporting the characters and their music.